1) No! No! No! The answer is No! What’s the question? The question is, have Americans been told the truth about profitable passenger rail systems in the world, and the answer is No! It’s been the constant Big Lie that’s been told over and over again by Amtrak, it’s wholly owned lapdog organizations, authoritative people who should know better, supposedly prestigious magazines, and a host of innocents who haven’t bothered to do their own research. The truth is, a number of passenger rail systems in highly developed Western countries all have profitable passenger rail systems which are efficiently run, provide excellent service for passengers, and hold the esteem of bankers and various financial people. In short, just the opposite of what Amtrak, and it’s Amen Corner echo, the National Association of Railroad Passengers, and various others, including members of government want you to believe, because constantly telling the Big Lie provides an excuse for the dismal performance of Amtrak. It’s not nice to lie. 2) Here’s how it started: Railway Age Online, on Tuesday, February 24, 2009 published the following excerpt from International Railway Journal. Netherlands Railways (NS) says the introduction of an ambitious new timetable and the opening of new stations helped it to maintain its healthy financial performance last year, although net profit fell by 281 million euros ($357 million) to 56 million euros ($71 million). NS warned that its success in 2008 is unlikely to be repeated this year as the global financial crisis is expected to slow the growth in passenger numbers. NS says it is looking at ways of reducing costs and could sell off non-core areas of its business. So, it seemed those wily Dutch were doing something allegedly no one else was doing, and the International Railway Journal was using normally verboten words in the United States like "profit" when referring to a national passenger rail system. This required some digging, and the article and subject matter was tossed out to United Rail Passenger Alliance’s discussion and study group for comment. Here is what ensued. CONTRIBUTOR ONE: The Europeans have culturally accepted rail as a primary form of transportation. It's profitable simply due to active use and streamlined operation. In the US people would rather fly or drive, still. CONTRIBUTOR TWO: ... Remember that movie "Field of Dreams"? It was okay. But, remember how the neighbors of guy that built the ballpark tried to put him out of business because he was going to go broke? They saw a nutcase who was going to go broke so they tried to do him in. It would be the same with passenger service. You will not get much aid and comfort for trying, but you will get lots of folks willing to help you fail! CONTRIBUTOR THREE: And, lots of state subsidy I expect, just calling it something else, to wit: Britain's "profitable" private train operators who are on the government dole, paying a fraction of costs of their physical plant. Here, we would call that "corporate welfare." CONTRIBUTOR FOUR: Here, we call that "Acela" and "NJ Transit". CONTRIBUTOR SIX: Take a look at the Deutsche Bahn 2007 Annual Report [Germany] (on their website). At least at the EBIT [Earnings Before Interest and Tax] level, they say they made money on all of their passenger services (and freight as well). What any given service would look like after interest and taxes, they don't say. CONTRIBUTOR SEVEN: Yes, but the true focus here - and what Contributor One is saying, too – is the system is robust enough to actually promote a profit. If there is enough activity – trains, rational frequencies, passengers, momentum – the system can throw off a profit. It's only those who want to believe that passenger rail MUST be a creature of government that don't want to believe this could happen. Remember, every "credible" source in the country always says there are NO passenger systems in the world which make money. CONTRIBUTOR SIX: Yes, there is that allegation. BUT, it is actually untrue on two grounds. 1. The three Japanese railways (East, West and Central Japan) make money, period. It is true that there is a question whether the value at which they received their assets in the privatization was too low. Maybe, but you can read their Annual Reports on the web – they are listed on the NYSE (poor guys) – and the numbers are out in the open. One can argue that the SNCF [France] makes money on the TGV, at least Paris to Lyons, but the bookkeeping is not public. 2. There are a number of competed franchises in the UK, Netherlands, Sweden, and Germany that make money on passenger services, as do some of the concessions in Buenos Aires and Rio. In these cases, Government is asking for minimum subsidy, and they get pretty efficient service. I will be happy to debate the UK experience at length if anyone wants (see the highly informative website www.tgaassoc.com for this and other studies). With this said, most passenger operators are unprofitable in the financial sense; their revenues from customers do not cover their costs. Governments make up the difference for social, economic, environmental, or political reasons, or a mix of all of them. Sometimes the governments do the right thing, sometimes they don't. There is also a caveat about the Netherlands numbers – what is the railroad paying for access charges to use the infrastructure? The Dutch only wanted their operator to pay marginal cost access charges: in their case, this was only about 12 percent of the total cost of infrastructure. The Government paid the rest directly to the infrastructure manager. By comparison, the DB [Germany] operators are supposed to pay the entire cost of infrastructure from their access charges. See the most recent update of EU access charges on the website I mentioned above. CONTRIBUTOR EIGHT: I think you're on thin ice here. If the infrastructure is subsidized, is the operation profitable? Within the parameters set, perhaps. In the real world, perhaps not. Are airlines profitable if they don't take provision of airport facilities, air traffic control, etc., into account? Truckers too, for that matter. CONTRIBUTOR NINE: All of these are legitimate – and preferably quantifiable – facets of "profitability," however defined. What one needs to remember is that, in what passes for US policy debate about Amtrak, the mantra of "no passenger service makes money" is almost never a quantified or verified observation about the economics of rail passenger service, but an all-purpose propaganda excuse for Amtrak failures and a bogus premise for complete shutdown of further inquiry, lest any new examples of Amtrak's incompetence and duplicity emerge. CONTRIBUTOR TEN: Gentlemen, as the inimitable Brother Dave Gardner ("The earth is a southern planet – have a moon pie and an RC") used to say, "it's all in how you look at it and study it." And, unfortunately, there is no accepted common basis for looking at it and studying it, particularly with regard to our favorite carrier of last resort, who has made a masterwork of consistently pulling newer and more innovative figures and formulas out of an increasingly vast number of heretofore undiscovered ... openings. The "bottom line" shell game has produced a crop of apples and oranges so extensive that it would cripple the Pacific Fruit Growers’ Express fleet. That's the payment for politicizing a business. And it's all legal; just don't you try it. This is why the best stuff has always come from people who dig through and distill the figures. CONTRIBUTOR EIGHT: Don't get me wrong. The need for subsidy in some instances is no excuse for inefficiency, for failure to make the best use of assets. If your fare box recovery is 55% you should still be straining every sinew to make it 56% or better, because you owe that responsibility to the "owners," in this case the taxpayer. I attend public meetings and frequently ask the question "Is that the best you can do with my money?". I'm not always the most popular person in the room! CONTRIBUTOR ELEVEN: The question as I see it is, "Can we draw a line, to the left of which is Infrastructure, and to the right of which is Operations; and draw that line so that Operations is profitable?" The traditional view of Amtrak is that such a line cannot even be drawn. The fact that an actual passenger railroad has drawn such a line, and made a profit, proves that such a line CAN be drawn. CONTRIBUTOR SIX: Yes, a line can be drawn. The EU has demanded that a line be drawn and, with great reluctance, the EU railways have gone along. The famous American railroad belief that the EU model has failed has missed this point entirely. With infrastructure separated from all operators, then you can draw a line around infrastructure and tell whether the infrastructure is stable or not. You can also evaluate the performance of the operators as well and, if you want, you can privatize some operators while keeping others public. The problem comes when they try to set up access charges. The Commission recommends the access charges be set at marginal cost (hard to define, but most people believe it is about 15% to 20% of total costs) with the government making up the remainder. But, the Commission also permits the infra manager to charge more than marginal cost if the government sets a financial target that includes more cost recovery above marginal costs. The result is that some governments set the marginal cost target and make up the rest directly to the infra manager, other governments set varying degrees of full financial cost recovery as a target. When the target is above marginal cost, then the "markups" become critical, and they are fraught with difficulties that no one really has a perfect answer for. The most recent report on this issue (www.tgaassoc.com) covers the issue as well as it can be covered. In fact, when Amtrak pays access fees to the freights, the line has been drawn (we don't know how the freights calculate their charges, and Amtrak and the freights refuse to reveal what the access charges are – a guess at about $3.00/train mile is about right). And Amtrak is happy to charge the freights full costs plus a considerable markup for the use of the Northeast Corridor while, in principle, they are charging the commuters marginal cost. Again, though, there is no information or backup about the charges. CONTRIBUTOR NINE: Well stated. In the case of Amtrak, the drawing of the line has been done by that ever trustworthy draftsman, the Congress. For off-NEC situations, the Surface Transportation Board — contrary to popular belief — is not held absolutely to incremental costs when forcing Amtrak onto an uncooperative freight railroad. Under 49 USC 24308(A)(2)(C), the STB is to determine "the extent to which, the compensation shall be greater than the incremental costs of utilizing the facilities and providing the services." Apparently this standard governing off-NEC access was not altered by the recent legislation [Pub. L.110-432, Sec. 212, 122 Stat. 4848, 4925-27 (Oct. 16, 2008)], but it did set up a new regime of STB-adjudicated damages (not fines, as misstated in the press) for "substandard" freight performance of obligations, pursuant to new 49 U.S.C. 24308(f). On the NEC, where Amtrak is the landlord vice tenant, the recent changes are very significant. 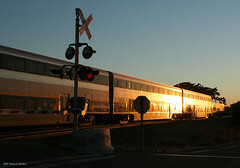 For freight carrier users of Amtrak’s NEC infrastructure, the pre-October 2008 standard of compensation to Amtrak was that the STB "shall assign to a freight carrier … the costs Amtrak incurs only for the benefit of the carrier, plus a proportionate share of all other costs of providing transportation … incurred for the common benefit of Amtrak and the carrier. The proportionate share shall be based on relative measures of volume of car operations, tonnage or other factors that reasonably reflect the relative use of rail property covered by this subsection." [49 U.S.C. 24904(c)(2)] Note the absence of comparable statutory specificity for the payments to be made by commuter operators. No accident. However, a potentially monumental change has been made — very inconspicuously – with respect to the NEC. See Pub. L. 110-432, Sec. 212(b)(2), 122 Stat. 4848, 4926. The limiting word "freight" has been deleted. Thus the statutory standard for STB cost allocation now applies to commuters as well. There was also an existing directive [subsection (c)(1)] that NEC access agreements with freight and commuter carriers "shall provide for reimbursement of reasonable costs, but may not cross-subsidize intercity rail passenger, commuter rail passenger, and rail freight transportation." But, the pre-October 2008 statute contained no parallel coverage of commuter rail in its prohibition [subsection (c)(2)] in STB adjudications of access charges; only cross-subsidization between intercity passenger service and freight was prohibited there. No coverage of commuter service. No accident, again. That deficiency, too, has now been cured by Section 212(b)(2) of Public Law 110-432: "commuter rail passenger" service has now been made part of the cross-subsidization provision governing the STB’s adjudications. These fundamental changes, based on the plain statutory language, would seem to require immediate – well, by government standards anyway – adjustment of the STB’s now superseded administrative standards for assigning costs in NEC access disputes. There is no delayed effective date for these changes (as with the Amtrak board structure, for example), nor is there any statement that the advisory committee regime I am about to describe displaces any STB obligation to revamp its NEC cost standards right away. Thus, any affected party could — and probably should — immediately file with the STB seeking the immediate opening of a new proceeding to replace the old standards. However, there is to be a new NEC access formula developed by the new Northeast Corridor Infrastructure and Operations Commission (NCIOC), established under Sec. 212(a) of Pub. L. 110-432, new 49 USC 24905. The Commission is to consist of members representing Amtrak, DOT/FRA, each state on the NEC (even the one that runs no commuter service whatever), plus DC, and the freight users of the NEC, but the freight representatives must be "selected by the Secretary." Interestingly, only the freight representatives are also prohibited from voting. See new 49 USC 24905(a)(1)(D). Again, presumably no accident. This new, late 2010 formula is to be accompanied by a "proposed timetable for implementing" the formula by October 16, 2014. Whatever the practicality of the mandated formula and any accompanying complexities, it’s only the beginning of a wild and tortuous ride. Remember NCIOC is an advisory committee. But, the newly amended statute requires that "Amtrak and public authorities providing commuter rail passenger transportation over the Northeast Corridor shall implement new agreements for usage of facilities or services based on the formula proposed [by NCIOC] in accordance with the timetable established therein." Note again, no mention of the freights. I do not pretend to expertise regarding the Federal Advisory Committee Act (FACA), but making the recommendations of an "advisory" committee legally binding without any further intervening action by the Congress or the President seems dicey. Moreover, making the amended cost-allocation statute the default standard if the NCIOC process falters necessarily implies that whatever NCIOC does is expected to be somewhat at odds with or at least different from that statute, so it virtually has to constitute the improper delegation of authority to NCIOC to supersede a federal statute. A second legal time bomb: as far as I know, there are existing access agreements covering all the current NEC tenants, presumably with specified prices and durations. I think to the Constitution, these are known as "contracts." Impairing same by the feds is a big no-no. And, then there’s the across the board stiffing of the freights — no vote inside NCIOC, and no assured coverage by the new NCIOC formula. Nothing resembling due process. Deliberately perverse incentives to assure that no consensus NCIOC formula is ever implemented? A clever strategy by the freights to plant some constitutional land mines with which to overturn the statute? In the absence of additional information, I will adhere to the hallowed proverb of Rep. Al Swift (former D-WA): "Never assume conspiracy when mere incompetence will suffice." As Contributor Six correctly points out, actions and words (even statutory words) are often at considerable variance, and the standards (present or future) I have described apply in practice only when an access dispute finds its way to the STB. In any other situation, what Amtrak, the commuters, and the freights do in actual negotiations and the setting of unlitigated access pricing and related cost-sharing charges is quite another matter. Whatever the state of play there, it is a virtual certainty that Amtrak’s demonstrably unreliable accounting and lack of transparency is an additional unhelpful factor. Now, at least on the NEC, a further degree of turmoil is virtually assured by the recent statutory changes, even the positive and the non-opaque ones. CONTRIBUTOR TEN: Contributor Six and Contributor Nine, well put; both of you. The real problems, as both have stated, is that (1) Congress loves to mix apples and oranges to its own political ends, (2) there is no traceability and/or common methodology to the calculation of incremental costs by the various parties in individual agreements (i.e., what is incremental to one is not to another) including Amtrak, and (3) the remnants of the arcane railroad accounting systems are still also muddying up the waters. It will be interesting to see if the EU can force consistency on their systems. 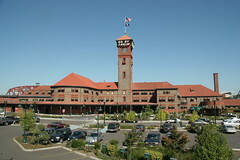 It's the 21st century version of the application of the old Interstate Commerce Commission formula: Santa Fe consistently reported an above the rail profit for its passenger services because they viewed them as solely incremental and only charged what they believed they actually added in real costs, while Southern Pacific took all the allowables ever given them and would, for example, charge half the total cost of the Sunset Route infrastructure to the Sunset Limited passenger train when it was tri-weekly in order to show a whopping loss. The railroads did not magically and immediately roll in dough on May 1, 1971 when Amtrak came into being. And, that's why. Just remember, in the early 1950s, SP President Russell succeeded in convincing the ICC that SP should be able to drop all interstate routes less than 300 miles because "short hauls don't and can't make money, but, long hauls do." Within 10 years, he and successor Biaggini were back before the ICC axing long distance trains because "long hauls lose money and only short haul corridors less than 300 miles can make money." That, folks, is the epitome of creative accounting. I am drawn back to what URPA showed 25-30 years ago, that Amtrak has taken full advantage of the old approach (remember what [former Amtrak Board of Directors member ]Joe McDonald discovered on the Montrealer [passenger train route between Washington, D.C. and Montreal, Quebec]) it inherited from PennCentral (mostly) to say what it wants to say when it wants to say it. This, of course, still extends to gouging states when it wants to (which is generally constantly). And, the most obvious result is that when national system (read "long distance") routes come off, the deficit goes up. When McDonald reported to the Amtrak board that they were obtaining a black hole when they got the NEC from PennCentral, he knew exactly what was going to happen, and he was completely right. For you who are too young to remember, Joe was a Vice President of Continental Can, with an extensive background in corporate operations and accounting who was appointed to the Board as a consumer rep all the way back in the 1970s. He discovered, among other things, that PC, and then Amtrak, were charging the Montrealer crew costs on one division in Connecticut that would account for a total of 26 enginemen and trainmen (not onboard services) on board a single Montrealer trainset at any given time, and after extensive investigation, determined that such "accounting" was occurring all over the NEC in order to prop up [former Pennsylvania Railroad President] Stuart Saunders' old myth that led to President Lyndon Johnson subsidizing Pennsylvania's first Metroliner program. Unfortunately, he succumbed to cancer before he got all the way to the bottom of it. As we have said for decades, they've been cooking the books since the beginning. As long as all of the involved parties are going to play this game, don't expect any real progress, either here or (equivalently) overseas. 2) That may have been just a tiny bit on the – shall we say – "dry and technical" side of things, but, the point is, anyone willing to do some honest research can discover throughout the world passenger systems do make money. Some of the systems are playing with similar rules to what Amtrak plays, some systems have a slightly easier time of it, and some have a more difficult time. The bottom line is, there is nothing that keeps Amtrak from being fiscally responsible and fiscally self-sufficient except that Amtrak chooses not to take that path. We have demonstrated in TWA before that when Amtrak reaches enough critical mass of a combination of rational frequencies, services desired by passengers, and long enough trains, it can be a government-owned, self-sufficient enterprise, without the annual worry of begging federal and state governments for money for everything from operations to new equipment. It’s true "profitability" is done elsewhere, and it’s true it can be done here. Until now, we have just chosen not to do it, and, in the process of enabling Amtrak’s constantly bad fiscal behavior, have continued to rationalize the constant lies told to us by far too many organizations, people, publications, and members of government. 3) Okay, you say, how do I change this? Well, first, do your own research. Everything stated above is available on the Internet. Visit the sites above, visit the sites of the passenger railroads from around the world, visit the World Bank’s web site, visit sites where Amtrak statutes can be found, and confirm for yourself what the law says. Question everything and everyone. Don’t take anything at face value unless it’s backed up by facts. Second, take your research and forget everything you have learned about passenger rail in the United States. The sad reality is, the U.S. is horribly behind the rest of the world in every facet of passenger rail, even to the point there is not a single home-grown major passenger car builder in the country, and we were the home of Pullman-Standard, which, along with Budd, were the two most prominent passenger car designers and builders in the world. Now, both are gone. As you take your newfound research and study it with an open mind (Not tainted by what you know about Amtrak and it’s ongoing follies. ), start applying it to a new generation of Americans who are willing to try different modes of transportation. This does NOT mean different types of automobiles, it means different types of transportation, such as air, surface, and water. Ask yourself, if someone is willing to leave home and travel, what are their requirements? How important is time spent traveling, availability of schedules, and amenities while traveling? Is speed always the overriding factor? Where do comfort and convenience fit in? If you have ten different people, are there ten different preferences for mode of travel? Since people come in all shapes and sizes, should everyone be required to fit into a 19" wide seat, elbow to elbow and be allegedly happy about it? Once you have reached your conclusions, start looking around and seeing why some modes of transportation are more popular than others. Is popularity based solely on convenience and cost, or do other factors come into play? Are the two most popular forms of transportation – air and private vehicle – the most popular by choice, or by consensus that these two forms will be the only two forms supported by private enterprise and government? Then, start wondering how change can come about. We discovered in a previous issue of TWA earlier this year passenger rail is just a tiny fraction of less than one percent of the travel market, and Amtrak is statistically irrelevant. However, at times, it’s the number two recipient of federal dollars for annual infusions of free federal monies in the form of subsidies. So, we know Amtrak has constant, bi-partisan political support. But, why does it have support? Is it because it’s just another government program which can’t be killed with an atom bomb? What would happen if individual constituents across the country – especially outside of the Northeast Corridor – did their research and, in turn, attempted to educate their Senators and Congressmen? What would happen if Congress – Amtrak’s most important banker – suddenly said this country should have a viable surface transportation policy beyond building highways, and rational passenger rail is the answer? What would happen if every Congressman who has no Amtrak service or only midnight and wee hours of the morning Amtrak service demanded better schedules and connections for their districts, just like the East and West Coasts have? The end result would be a viable, robust passenger rail system that is not only sustainable, but desirable. That’s not going to happen as long as the grossly misinformed (often for their own benefit or political agenda) keep everyone believing nowhere in the world is passenger rail service profitable. When you say passenger rail service is profitable, it means two things: It’s sustainable, and it’s popular. When it comes to politicians, like congressmen and senators, "popular" is a critically important phrase, and it often translates into support. Amtrak isn’t popular. Amtrak continues to be America’s Best Kept Secret. 4) To fix the problem of Amtrak being America’s Best Kept Secret, several things have to happen. First, Amtrak has got to stop being a railroad principally focused on the NEC, and become what it is supposed to be, a national carrier. Second, it has to embrace the national, long distance system, where financial success is found, and political support can be successfully mined. Third, it has to have a viable business plan that doesn’t focus entirely on the development of ruinously expensive short corridors, but instead focuses on growth throughout the country. And, fourth, Amtrak has to have in place a new equipment plan that demonstrates a commitment to long distance trains and all levels of passengers, from short distance coach passengers to high-dollar sleeping car passengers, and everyone in between. 5) Go, do your own homework. Find out for yourself the truth about passenger rail and profitability in the developed world. Find out what everyone outside of the USA and Canada already know: Passenger rail is good, and passenger rail is viable and popular. Then, take your new knowledge and educate others. But, most importantly, stomp hard on those who want you to believe their convenient and/or ignorant lies. Demand the heretics tell the truth. Because, a lie is a terrible thing, and in the real world, there is nothing bad about passenger rail that anyone should have to lie about. Passenger rail is a good thing, and we should be telling people the good things about it, not the lies about it. 6) Everyone knows the two best national magazines in the United States about railroading are Progressive Railroading and Passenger Train Journal. Progressive Railroading produces excellent reporting for those in the railroad industry, and Passenger Train Journal provides a satisfying mix of history and perspective about passenger trains in North America and the world. In the current issue of Passenger Train Journal (2009:1, Issues 238), available on news stands now, PTJ Assistant Editor and Art Director Kevin Holland wrote a piercing essay, "VIA’s New Canadian Schedule: Too Much of a Good Thing?" in which he studies the lengthening of the Canadian’s transcontinental schedule by almost 13 hours westbound, and adds an entire extra evening onboard for passengers traveling from launching terminal to end terminal. Mr. Holland presents a sound analysis of whether or not the Canadian is actually providing transportation or just another tour train, and a number of associated issues. He writes with brevity and clarity. This article is required reading for anyone studying the various facets and merits of passenger rail travel. Activity: Crews have removed the median barrier in the area of approximately 8700 South and Bangerter Highway (just south of the Old Bingham Highway overpass). The median has been replaced with water barrels and will remain closed through mid-February. UPDATED Activity: Crews will be performing work on the bridge structure at approximately 8700 South and Bangerter Highway. Traffic Impacts: The centermost lane in each direction will be closed on Bangerter Highway from January 26th through March 13th. UPDATED Activity: Crews continue to work on the sound wall on the north side of Sugar Factory Road between 2200 West and approximately 2450 West. Traffic Impacts: Traffic has been shifted to the east side of 2200 West until February 27th. UPDATED Activity: Crews continue to work on Old Bingham Highway near the Bangerter Bridge overpass. Traffic Impacts: Traffic will be restricted to one lane with flagging operations at the overpass on February 25th and March 5th through the 10th, except on the weekend. NEW Activity: Survey work will be taking place at the 9000 South grade crossing. Traffic Impacts: Traffic will be subject to traveling closures for surveyors working in the area on Thursday, February 26th. Please be aware. NEW Activity: Crews will be resuming work on the bridge at 7800 South near Gardner Village. Traffic Impacts: Westbound traffic will be shifted to the south side of 7800 South on March 9th until March 13th. Activity: Crews are performing utility work on 1300 West at the trackway (approximately 7900 South). Traffic Impacts: 1300 West is completely closed at the trackway until March 2nd. Please plan accordingly. Activity: Construction on the Jordan River TRAX bridge. Traffic Impacts: A temporary detour began the week of October 13th, 2008 on the Jordan River Parkway Trail near approximately 7500 South. The trail will be intermittently detoured through August 2009. Please be aware that the detour does cross a live railway track, and as such, the detour will be closed daily from 7:00 p.m. to 7:00 a.m. when freight is actively running on the track. Please plan accordingly. Farmington’s Future…is it transit based? A real estate agent up in Farmington talks about the Farmington Station project. He also mentions how he wished he didn't have to leave Farmington to spend his retail dollars. Of course by spending money in a chain store he is still sending his money out of town so what's the difference? What Does Beauty Have to Do With Sustainability? Should A older Wal-Mart or an urban freeway that destroyed a neighborhood be considered for historic preservation since some of them are getting up in there in age? Most small business owners fear the lost of parking spots and always blame their drop in customers on a lack of parking. However, a new study in one community found out that many customers do not arrive by car. Plan for a street in a tourist area that will focus on the pedestrian. More from the circus that is going on in California. It now looks like all transit operating funds will be cut meaning massive cuts to service across the state. Now they are also talking about a "hard spending cap" which would mean if a project is approved by the voters, a similiar amount has to be cut from the general budget. The author makes a good point in that we need to change the way we look at developments and make them less autocentric. The National Association of Railroad Passengers has released their newest dream plan for rail passenger routes. Sadly it looks pretty similar to a map I found that they produced in 1978 except there are fewer trains actually running now. Hopefully Boardman will shake things up at Amtrak is it is badly needed, but I will believe change will happen when I see it actually happening instead of just talk. More HSR money on the way? 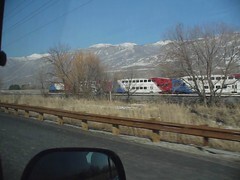 Once again, High Speed Rail will do little for us out here in Utah. What we need is upgrades to existing routes and increasing the system of trains. Strange, none of those green talking actors and actresses actually took green transportation to the Oscars. To top it all off they closed the Highland/Hollywood subway station for "security reasons" which created more traffic problems. Light rail is working even in Phoenix. Something that everyone should read. Current Construction: TRAX construction is taking place in conjunction with UTA’s bus rapid transit project on Market Street. Crews are currently working on the station platform between West Valley City Hall and the Public Safety Building. Pedestrian access is being maintained, watch for way-finding signs and project fact sheets for more information. Upcoming Construction: Work has extended into Market Street as crews begin work on the station platform. Current Construction: Progress has been made on the TRAX bridge over I-215 on the south side of 3100 South. Crews have now moved the crane from the west side to the east side of I-215. The foundation work for this structure includes driving steel pile into the ground using a machine that may generate significant noise and vibration for local residents. To help alleviate impacts, pile driving activities will be limited to the hours of 7:00 a.m. to 5:00 p.m. Monday through Friday. Work on the south side of 3100 South near the E Center continues as crews prepare the way for TRAX. Upcoming Construction: The intersection at Mapleway and 3100 South will be closed to traffic for the next two to three weeks from 7:00 a.m. to 5:30 p.m. Motorist are encouraged to use 3360 South during the daytime hours. Pedestrian access will be maintained at all times through this closure. Traffic Impacts: There will be some lane restrictions on I-215 as crews progress with bridge construction. Reach Description: Reach 3 is the area along Decker Lake Drive from 3100 South to Research Way (2770 South) and running east to Redwood Road. This area includes many commercial office buildings with thousands of employees who access this area on a daily basis. We will continually work to ensure access is provided. Current Construction: Construction continues on Decker Lake Drive as crews work on the storm drain on the east side of the road. Access is being maintained and we thank the businesses and motorists for their support during construction. Current Construction: Crews have installed a permanent wall along both sides of the Crosstowne Trail in Chesterfield. Significant drainage and irrigation work has also been accomplished, as well as foundation work for TRAX’s overhead wiring system. We would like to thank the residents for their patience during construction. Upcoming Construction: This coming spring, crews will backfill the area along the new fence on each resident’s property. Reach Description: Reach 5 includes construction along 1070 West in the Chesterfield industrial area. This reach will include a bridge structure over the Jordan River and another over 900 West. Current Construction: The majority of construction in this area is taking place on 1070 West just north of Parkway Avenue. Third party utility work is currently taking place. There will be some lane restrictions implemented. Work on a joint trench for utilities and a sewer line is taking place along 1070 West, as well as pile driving for a retaining wall. Upcoming Construction: Construction is anticipated to take place for the next several months. After the third party utilities are completed, crews will begin construction. Traffic Impacts: As construction proceeds, there will be lane restrictions. However, access will be maintained at all times. Reach Description: Reach 6 runs through the Union Pacific Railroad’s Roper Yard area. Although there are no businesses and residents in this reach, extensive coordination will take place with the Union Pacific Railroad to ensure that freight deliveries and other train travel will be maintained. Reach 6 will include an extensive bridging system that will enable TRAX to operate above ground, over other train traffic. Current Construction: Progress has been made on the overhead structure in roper yard. Crews have installed steel piles 120’ into the ground to form the main foundations for the aerial bridge. Reach Description: Reach 7 is the area where the West Valley Line will connect with the current North/South TRAX Line. Construction will take place along Andy Avenue in South Salt Lake. Crews will closely coordinate activities with businesses to ensure access is maintained. A construction survey has been conducted with the businesses along 400 West between Andy Avenue and 2100 South to determine the best time to construct in the Andy Avenue/600 West intersection. We will get back to businesses to deliver the survey results and ensure adequate access. Current Construction: Storm drain installation along Andy Avenue has been completed. We thank the businesses for their support. UTA is committed to maintaining 24-hour access to all of the businesses and residences along the construction corridor. We will coordinate with businesses in cases where access might be temporarily limited. If you have further questions or any comments regarding the project, please contact our toll-free 24-hour hotline at (888) 800-8854 or e-mail thope@rideuta.com. You can also visit UTA’s Web site at www.rideuta.com. Below is the FrontRunner South construction update for February 16-22. Crews will be installing micro-fiber throughout the area this week. Fiber optic work continues in the area with crews installing micro-fiber. Crews are also constructing a bridge adjacent to the current Union Pacific Railroad bridge at 144th South. Crews will continue to work on the walls of the structure this week. Fiber optic work will take place throughout the area with crews installing micro-duct this week. A temporary traffic light has been placed at 144th South and the Union Pacific Bridge to help with traffic flow. If the signal light is flashing, construction crews have flaggers on the road to help speed up traffic although there may be some delays while crews are moving equipment. Crews anticipate removing the temporary traffic light within the next week or so and will be placing stop signs in their original locations at the bridge. We thank motorists in this area for their patience and support during construction and ask that you be cautious while driving in the area. Crews will begin to construct a lay-down area at the site of the future Park & Ride to stage materials for the project. Crews continue to establish access in this area and prepare the site along the railroad corridor in Bluffdale and Lehi. Excavation and embankment work throughout the area will continue this week as will fiber optic micro-duct installation. Crews will form and pour concrete for the walls and deck of the East Jordan Canal bridge and bring in a crane to prepare for construction of a bridge spanning the Jordan River. Crews will place drains and form and pour concrete for the floor of the pedestrian tunnel that will run underneath the Union Pacific trackway at the Lehi Station. They will also begin excavation and embankment work for the new Union Pacific Railroad Siding on the west side of the corridor near the Lehi station. Crews will continue fiber optic relocation work in the area this week with boring taking place at roadways. Construction continues on a bridge spanning the American Fork River. Crews will form and pour the south abutments and wing walls this week. Crews will be installing micro-duct throughout the area to prepare for fiber optic relocations and also will be working on water lines at 100 West. A road closure is planned for 100 West from Wednesday, February 11 until Wednesday, February 25 so crews can install casings on two water lines. Traffic at 100 West will be detoured onto Storrs Avenue during this time. Crews have constructed a lay-down area at the site of the future Park & Ride to stage materials for the project. Crews will continue fiber optic relocation work throughout the area this week. Thanks again for your interest in the FrontRunner South project. If you have construction-related questions, please call our 24-hour construction hotline at 1-888-800-8854. If you have specific questions about the FrontRunner South project, my contact information is listed below. To unsubscribe from this list, please click here, or simply send a reply message indicating you wish to unsubscribe.